With over one-quarter of its land mass dedicated to protected reserves and national parks, there are vast tracts of unspoiled beaches and tropical rain forest just waiting for you to explore. Guided tours will take you on magical hikes into the forested hills where clouds, trapped in the high lush trees, glow in a misty half-light. The sounds and sights of nature unfurled in all of her splendor will mesmerize you. Costa Rica is a wonderful destination full of charm and character with an abundance of activities and amenities to enjoy. Beauty and nature surrounded you in Costa Rica with its stunning Volcanoes and waterfalls to the lush green vegetation and calm waters that surround you. For the more adventurous visitor you can enjoy hiking though rain forests and national parks such as Manuel Antonio or enjoy surfing in Tamarindo and white water rafting. In under 5 hours, you can fly from NYC to Costa Rica and have your toes in the hot sand within no time. Once you arrive you will find that you have stepped into a world that’s quite extraordinary. This country is a hybrid that captures the historical significance of Central America, crossed with Caribbean life, with a Pacific coast feel. At Exceptional Villas, we have decades of experience in creating the loveliest memories for our clients. Your happiness means the world to us. From the moment you reach out to us, we ensure that every aspect of your trip to Costa Rica is smooth, stress-free and bespoke. The Villas in Costa Rica are unique and beyond compare. Many of the Costa Rica Rentals especially those located in the beautiful Tulemar Resort in Manual Antonio, the seaside town of Tamarindo and the villas on the very exclusive Papagayo Peninsula have combined contemporary designs with incredible art giving them warmth and substance not found in many other contemporary homes in the world. Take for example the beautiful Papagayo Villa Cielo Mar and Villa Mel which are both exquisite and beyond comparison vacation rentals. In contrast, the Costa Rica Vacation Rentals located in the Los Suenos Resort, Las Catalinas and The Palms provide a more traditional offering of colonial and Costa Rican style architecture and design. Costa Rica is located 670 miles north of the equator and on a map Bali is located roughly the same distance south of the equator. 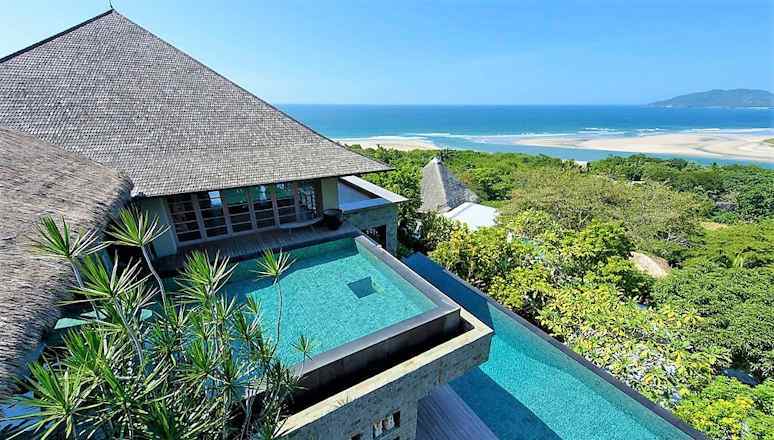 The result is that not only does the topography and landscape have a lot in common but the Villas in Costa Rica and the villas in Bali also have a lot in common. Many of the Costa Rica Rentals are decorated and designed by Balinese experts and are filled with incredible pieces of one of a kind Balinese’s art and furniture. Other properties that discerning travelers love include the luxury Costa Rica Villa Nova in Ocotal have used floor to ceiling glass walls through the house that enables the lucky occupants to enjoy the incredible scenery and the amazing Costa Rican biodiversity every moment of every day. The other wonderful thing about staying in Costa Rica is that not only are the luxury Costa Rica Villas better value than any other destination offering a similar standard luxury product, but you will also find that shopping and eating out are better value too in comparison to other destinations. Villas in Costa Rica also offer much better value than luxury hotels. And last but not least, if you are the type of person who likes an experiential holiday, then Costa Rica is ideal as there are so many things to do in Costa Rica including a visit to a Volcano. Arenal Volcano is one of the most popular to visit while in Costa Rica. The destination is full of amazing waterfalls, breath-taking vistas and pristine sandy beaches. Jaco is another nice location to visit while on vacation here. When booking your vacation our team will speak to you in-depth about your requirements and will ensure that we match the best properties to your specific needs. Our team will ask all the basic questions such as the number of bedrooms and bathrooms you require but we go much further than that, we will find out exactly what you dream vacation looks like. Next we will send you a list of recommended villas where you can browse the villa gallery to view the images and see if the decor is to your liking. Once you have decided Our concierge Noreen will advise you on all the best things to see and do in Costa Rica. Based on your preferred dates our team will be able to assist you with planning a trip of a lifetime. Our friendly team has visited every luxury Costa Rica villa in person and return each year to ensure our exacting standards are maintained. With this first-hand knowledge, we can choose the most suitable property for you and your party. Every one of your requirements is considered in detail: how active is your group, do you want a relaxing beach-fronted villa, do you like a large pool, are there children in your party or individuals with mobility issues. The layout of each one of our luxury villas for rent in Costa Rica is a determining factor in helping us recommend the perfect home from home for you. We call this our ‘Match Made in Heaven’ service where you are given expert and intelligent advice on what properties will not only suit your needs but exceed your expectations. We want you to have the perfect getaway. We have been representing Costa Rica luxury villas for rent for many years and are very particular about the properties we manage. A five-star standard of luxury, a sense of privacy, remarkable views that take in the vast expanse of turquoise oceans, sunsets and sunrises to capture your imagination, each property must have beautiful and tasteful furnishings. We feature a wide range of properties from luxury ocean front estate homes in Tamarindo to contemporary villas in Ocotal. The inside and outside elements of the property must flow together and create a seamless experience. Once you are paired with your ideal luxury vacation villa in Costa Rica, our friendly and complimentary concierge service takes care of all the details of your trip. We can fast-track you through the airport on arrival, have an air-conditioned luxury vehicle ready to whisk you to the comfort of your beach-fronted property. As you step into the cool and beautifully-appointed interior of your luxury villas Costa Rica, your kitchen will be stocked with foods and beverages provisioned to your exact tastes. If necessary, staff will be on site to prepare your meals and discretely manage your stay so you can get down to the busy task of having the best vacation of your life. You can kick off your shoes, along with all the cares of your daily life, and sink into a hammock and drink in the sights and sounds of this tropical paradise. Nature in Ascendant. Costa Rica directly translates as The Rich Coast. It is what Columbus named it in the early 1500s as he saw gold jewellery adorning the natives along the shoreline. It is still a very accurate description of this country, as the diverse and bountiful natural features of Costa Rica are truly priceless. If you are looking for endless adventures and amazing experiences then Costa Rica is the place to go on vacation. The Guanacaste region of Costa Rica, lying to the northwest of the country is about an hour from Liberia Airport. This area boasts endless and unspoiled beaches. The Playa Hermosa is popular for water sports especially diving. Playa Blanca is a calm beach that attracts families who want to enjoy swimming in the Pacific. The Papagayo Peninsula that sits within this province has golf courses and numerous resorts that offer world-class dining for visitors. Villa Deveena restaurant in Playa Negra is the most popular restaurant, and it’s worth making a reservation to ensure you get a table. A gorgeous gourmet night awaits! The Dulce Golfo (Sweet Gulf) to the south of the Pacific coastline is a magical nature reserve waiting to be explored. El Silencio de Los Angelos (The Silence of the Angels) is a stunning reserve that is home to hundreds of species of tropical bird. Taking a break from one of your luxury villas in Costa Rica, you can set off in the cool morning air to explore by guided tour this mystical, tropical reserve. Apparently, Costa Rica has one-tenth of the species of the world’s bird population. Whether or not you are an ornithologist (bird fancier to you and me), the explosion of colours of many of these species and the rich musical backdrop they give to your day of exploration is sublime. The eastern coastline of Costa Rica sits on the edge of the Caribbean Sea and offers a less frenetic vacation than the west coast. A more boutique experience with a lot fewer high-rise developments is what sets this part of Costa Rica apart from the more evolved west coast. In the centre of the country lies Costa Rica’s capital, San Jose. The mountains that weave through the country make exploring by jeep an interesting experience. Beautiful views, lush pastureland with the Sabaneros rounding up their cattle. Coffee plantations hug the higher slopes of the volcanic hills, creating the most amazing photographic opportunities. Just one simple word! If you are one of the many individuals who cannot seem to get your beautiful eyes open each day without your bespoke caffeine infusion, then prepare for the most exquisite start to each day. The term ‘fresh coffee’ is bandied about far too casually in North America and across Europe. Until you’ve imbibed the rich and flavourful aroma and taste of Costa Rican Arabica coffee, grown and harvested virtually on your doorstep, you haven’t really had a coffee. The coffee barons who set up their plantations over a century ago realised that the rich volcanic slopes of Costa Rica were ideally suited to the cultivation of El Grano del Oro (or Golden Grain). Among the many things to do in Costa Rica, there are fabulous tours to some of these amazing working plantations in the Central Highlands and Southern Mountain range. At Exceptional Villas, we are delighted to organize any of these tours for you. We know the best places to visit and have established excellent connections with our team on the ground in Costa Rica who will shepherd you from one amazing experience to the next. To fully embrace the coffee experience of Costa Rica, you will have to try a café chorreado – a do-it-yourself filter coffee experience. This involves a quaint timber stand with a natural cotton filter sock. You choose the water-to-ground-coffee ratio to get the freshest (and we mean freshest), quietest and most bespoke coffee you’ve ever tried. Imagine waking up to the sweet sound of birdsong in your Costa Rica luxury villa’s air-conditioned bedroom, pottering along to your open plan kitchen and brewing your very own café chorreado. A short walk out onto your pool-side terrace, overlooking the ocean where you will sit and enjoy your morning coffee experience. That rushed noisy brew of back home is forgotten in the warm half-light of dawn. Costa Rica has made some wonderful decisions as a nation. It disbanded its army in 1948, and unlike many of its Central American neighbours, it is a peaceable and conflict-free nation. It invests a great deal of money in its schools and colleges, so its Spanish speaking population is well-educated and mostly fluent in English. The country has reached all of the ecological targets set by the United Nations Development Programme and is on track to be a carbon neutral nation by 2021 – the very first country to achieve this incredible accolade. As you enjoy living in one of the luxury villas in Costa Rica, it becomes abundantly clear that this country takes tremendous pride in the natural beauty of its nation. It is fully aware that as informed individuals, we want to engage with a sustainable and unspoiled paradise that is at one with its natural environment. Costa Rica is indeed a Rich Coast – not the gold that the greedy Conquistadores saw all those centuries ago but in the miles of clear and golden sandy beaches. The gold is found among the cloudy tip tops of the lush rainforests, in each delicious sip of coffee, poured to perfection. You can enjoy big game fishing, hikes into the hills, bird watching, maybe catch sight of a big cat or a chattering monkey. It’s all there waiting for you. At Exceptional Villas, we hold the key to this magical and marvellous world. We are waiting to unlock the very best of Costa Rica for you. 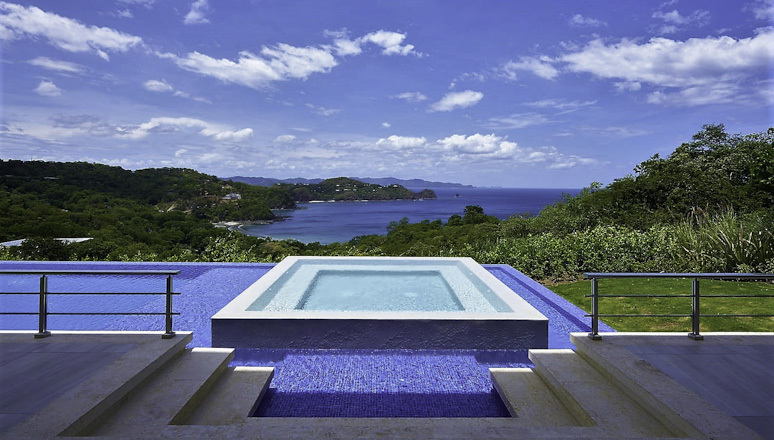 Villa Mel is one of the newest villas in Costa Rica and is also one of the most luxurious on the Papagayo Peninsula in Costa Rica. This exquisite 11,000 square foot villa features 5 bedrooms and has incomparable views towards the tip of the stunning Papagayo peninsula and the pacific ocean. 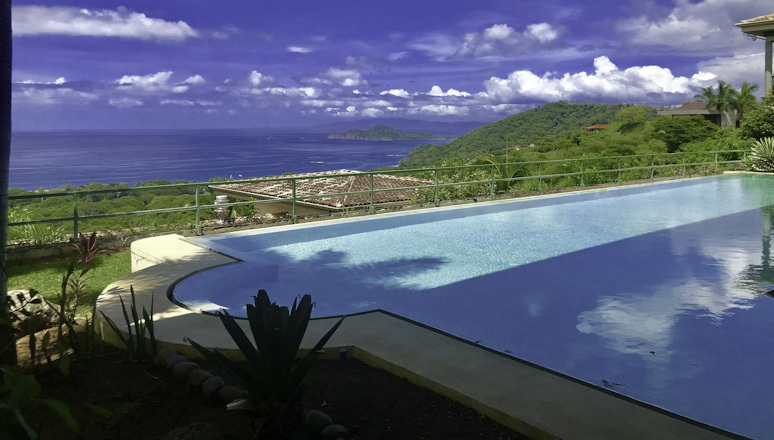 Villa Mel has one of the nicest settings in Papagayo and features one of the most wonderful infinity edge pools. Adults and children alike love this popular villa in Costa Rica. No matter which season you visit this luxury villa we guarantee it will be one to remember. 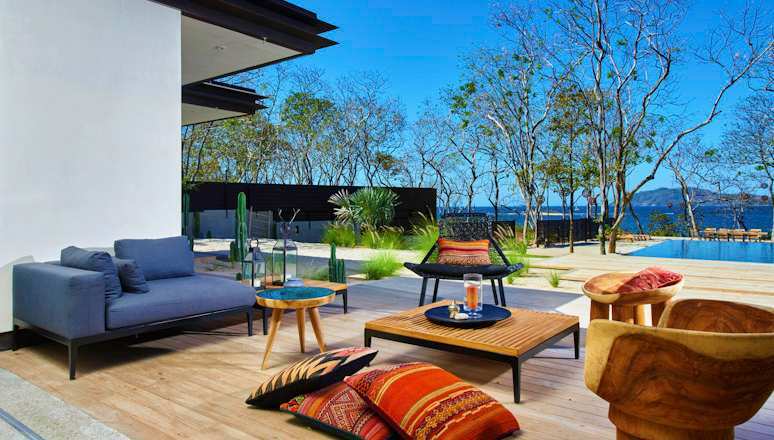 Papagayo is without a doubt the most exclusive residential area in Costa Rica. The second you enter the security gate of the resort, you will know you have arrived somewhere very special. The natural beauty of the jungle is offset with the spectacular views of the sea and coastline. The peninsula comprises of 15 miles or 24 kilometres of coastline and has 31 spectacular beaches as well as an Arnold Palmer golf course, the beautiful Four Seasons Resort and Hotel as well as the Andaz Resort. Villa Mel is lucky to have one of the best sites on the Papagayo Peninsula. It is close to the clubhouse, tennis centre, nature trails and cycling paths. As a guest of Villa Mel you can enjoy the stunning Prieta Beach Club where you will have complimentary access. There is a lovely white sandy beach here for you to enjoy. Our concierge Noreen will be pleased to assist you with making a reservations at Prieta Beach Club, specifically if you wish to dine in the restaurants here. The beach club is very exclusive and only available to a small number of homeowners. You will have access to a gorgeous swimming pool, restaurant, spa, gym and discovery children’s programme. The decor of Villa Mel is absolutely exquisite. The attention to detail is second to none, and the beautiful contemporary décor is offset by absolutely spectacular unique pieces of sculpture and artwork. We can highly recommend Villa Mel in Costa Rica for guests who are looking for somewhere very special indeed. 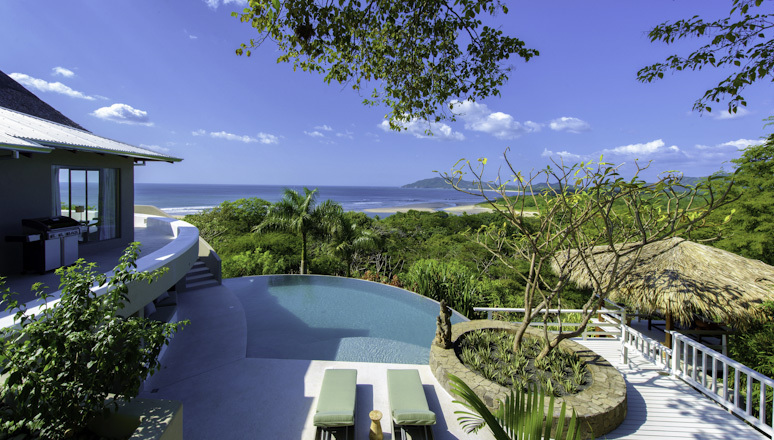 Sunset House in Tamarindo is one our client's most popular villas, and many of our customers return year after year to enjoy this spectacular Costa Rica Vacation Rental. It is a beautiful, relaxed 5-bedroom villa located just 5 minutes’ walk from the lovely town of Tamarindo. The slightly elevated position of the villa ensures that it has incredible views of the coastline. The terrace of Sunset house is spectacular. It has an outdoor kitchen, an outdoor dining room as well and lots of places to relax, read a book, or just enjoy the lovely Costa Rica sunshine. One might be forgiven for never wanting to leave the Villa. It is very tempting to spend days looking at the views and the early evening enjoying the spectacular sunsets, but the local town of Tamarindo has a lot to offer and well worth visiting and spending some time in. The beach is spectacular and is one of the best places to go surfing in Costa Rica. If you are a total beginner, do not worry as there are plenty of great surfing instructors our concierge team can recommend. There are also lots of great restaurants to enjoy and shops to browse around. 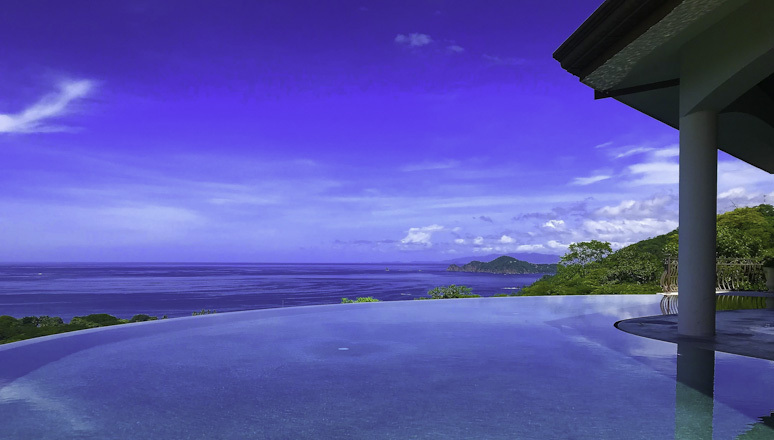 Mirazul Villa is located in the very exclusive residential resort of Tulemar in the town of Manuel Antonio. The gated resort of Tulemar is beautifully designed in the middle of the rainforest, so each vacation rental has its own privacy as well as having beautiful views of the ocean. Mirazul Villa is particularly special as it is located on the highest point of the Tulemar resort and therefore commands the most magical views of the coastline and forest. Most visitors to the Manuel Antonio area will visit the famous national park at least once, but if you stay at Mirazul Villa in Costa Rica, you will be able to see plenty of wildlife around the villas and gardens. Capuchin Monkeys, Macau, Sloths, Howler Monkeys and woodpeckers are common sites. The villa itself is a contemporary masterpiece. It has very modern clean lines which are offset beautifully with the most stunning modern paintings and unique pieces of sculpture. People who appreciate art will love this house, but then, of course, the best piece of art is the view which is absolutely breathtaking especially from the top floor of the house where the living room and open plan kitchen are located. Mirazul villa has four bedrooms and sleeps, 8 people. The villa has a lovely swimming pool on the ground floor, and it is also a short but steep walk to the beautiful private cove at the Tulemar Resort. Panorama Villa in Manuel Antonio in Costa Rica is one of the best villas in the world for a large group, special event or corporate retreat. It is also a great choice for weddings in Costa Rica. It is located above one of the most beautiful beaches in Costa Rica close to the famous Manuel Antonio National Park. This stunning Costa Rica Vacation Rental has been architecturally designed to take advantage of the views to both the surrounding jungle and the Bay and Beach at Manuel Antonio. The villa blends beautifully with verdant jungle and owners have even created monkey bridges to ensure the monkeys continue to enjoy their natural habitat. You are very likely to see a whole host of native wildlife from all the rooms in the house. The interiors are super modern yet very welcoming and homely for such a large house. The villa is four stories high and as you go up the views just keep getting better and better. At the very top of Villa Panorama, there is a spectacular rooftop terrace with full bar and oversized jacuzzi. This is the perfect place to enjoy the sunsets, have a party or even do some relaxing yoga. When you stay at Villa Panorama, your every whim will be looked after by our team of professionals at the villa. These include the house butler, chef and several housekeepers. Villa Panoramas has a lovely swimming pool on the ground floor, but it is also a very short drive to the beautiful beach at Manuel Antonio Bay. The location is wonderful being close to amenities including the beach and horse-riding. Click here to speak to our team and learn more about Costa Rica. Find out more info including our personal recommendations just for you.